It's that time of the year again: Valve has launched the Steam Winter Sale, offering the usual huge discounts on thousands of PC games from now until January 4th, 2016 at 10am PST. The Steam Winter Sale appears to be very similar to the last major game sale from Valve. Rather than offering daily deals and flash sales, all of the discounts throughout the Steam Store will remain the same until the end of the sale period. The highlighted deals on the front page will change, but the discounts will not. There are two unique features to the Steam Winter Sale. The first is the ability to collect Steam trading cards simply by browsing through your Discovery Queue. Cards are delivered to your Steam inventory every time you browse through an entire queue, for a maximum of three cards per day. You can also collect a card for every $10 you spend during the sale. The other cool feature is a comic by Valve called Gingerbread Jake in "Northpole Noir", which will be updated each day with a new page, so check back every day to see the adventure unfold. 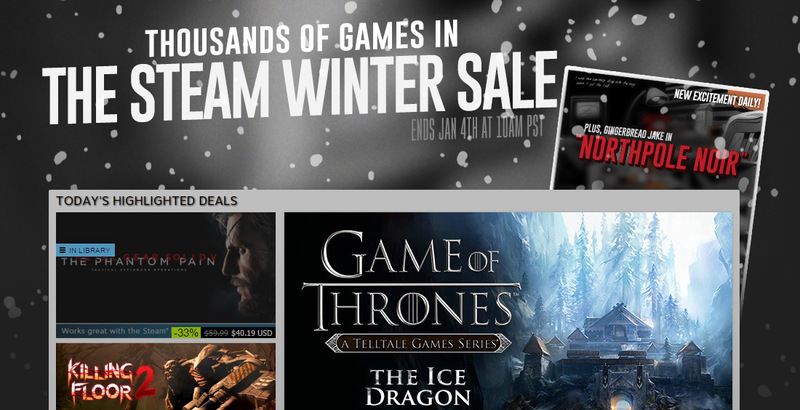 Aside from that, the Steam Winter Sale includes a typical selection of discounts. Some of the best deals that can be found include The Witcher 3 for 50% off, Grand Theft Auto V for 40% off, the recently-released Just Cause 3 for 20% off, and older games like Skyrim and Civilization V available at 75% off.